Professional Drone Pilot Training programs are conducted by FAA-licensed unmanned aircraft pilots from Adam Ringle Consulting (ARC), a Delaware-based industry leader in UAS training. 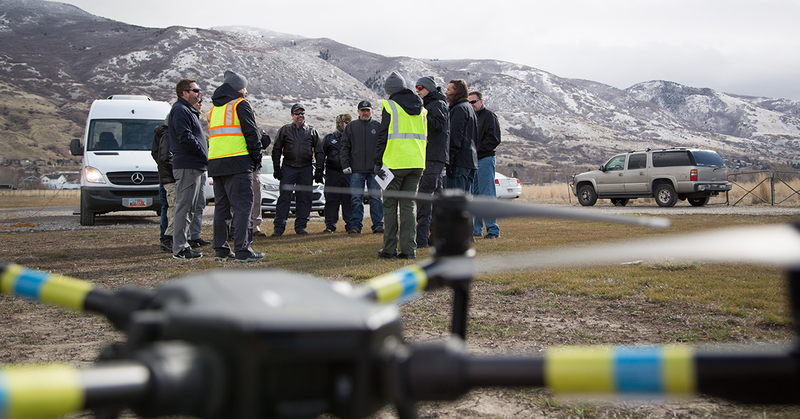 Training program content is provided by ARC and Rocky Mountain Unmanned Systems (RMUS). In cases of inclement weather, classes may be rescheduled. Note: This program is open to any participant age 18 or older. An FAA remote pilot certificate (part 107) is required to take this course. If you do not have an FAA Part 107 remote pilot certificate, please consider registering for our Professional Drone Pilot: Ground School and FAA Part 107 Test Prep. In addition, each student must successfully have completed either the Foundations of Flight course or have at least 5 hours of recorded flight time on sUAS. Paige Fitzgerald serves as a technical consultant for UAS program development and flight training, as well as emergency management solutions. Paige brings a unique perspective to the team at Adam Ringle Consulting as she has over ten years of management experience in both the public and private sector in a variety of business settings. A specialist in program management, Paige can not only help to create capabilities-based project objectives, but also help to implement program evaluation measures to ensure that proposed solutions are delivering results. She is well versed in personnel and financial management systems for small businesses and in public sector grant management. She has extensive public messaging experience across a variety of projects and proven record of creating buy in among groups of diverse stakeholders. In addition to program development and management, Paige holds a certification in business continuity planning. Paige has experience in a variety of instructional environments from online learning, to classroom courses, to hands-on skills training. As an emergency manager, she specializes in effective resource management and targeted collaborative approaches to project planning. She currently provides supervision for the administration of the Homeland Security Grant Program for the State of Delaware, and developed and administers the UAS program at an agency level. She is well versed in FAA regulations and requirements, including 14 CFR Part 107, especially as it relates to Public Safety flight programs. In addition to the her UAS program management experience, her flight experience includes many complex missions in adverse conditions such as night flying, high wind, and multi-use or controlled airspace. Other areas of specialization include NIMS compliant program development and reporting for flight programs. Eric brings his nearly three decades of aviation management experience to the team at Adam Ringle Consulting. He is a specialist in creating, implementing and overseeing aviation safety and training programs, He is in tune with the latest Safety Management System (SMS) information and coordinates with Airborne Public Safety Association (APSA), International Association of Chiefs of Police (IACP) Aviation Branch, FAA UAS Integration Office, the Police Foundation and Justice Technology Information Center (JTIC). Eric oversees a sixteen pilot law enforcement aviation agency which requires a quality management approach to controlling risks. He has implemented programs that provide the framework to construct and support a sound safety culture. In addition, he has a thorough understanding of how UAS utilization can impact civil liberties granted by the Constitution, as well as the ability to understand how to address these concerns through policy. His knowledge of federal and state regulations affecting UAS operational oversight is extremely valuable to UAS program development. In addition to the his manned and unmanned program management experience, his flight experience includes many complex missions in adverse conditions such as night flying, night vision device utilization, high wind, reduced weather minimums, and airspace deconfliction protocols. Adam B. Ringle serves as President, CEO and Director of UAS Flight Operations for Adam Ringle Consulting which he founded is 2004. Adam has more than 29 years of emergency services experience and 22 years of law enforcement experience. He possesses an extensive range and depth of knowledge in law enforcement, security operations, emergency medical services systems and UAS flight operations. He serves as the chief consultant designing custom professional training solutions and emergency response programs for both government and private entities alike. Adam specializes in workplace violence prevention, custom active shooter mitigation solutions and complex UAS flight program management. He is a certified level 1 thermographer, licensed fixed wing pilot, UAS remote pilot and instructor providing both training and operational support to clients. He provides expert witness services and maintains an array of emergency services certifications and licenses to best serve his client base. Adam has broad experience in law enforcement including tactical response team operator, uniformed services supervisor, investigative supervisor and crisis mitigation operational commander. Adam has commanded many large-scale responses and was responsible for directing multiple special programs for the Wilmington Police Department, in Wilmington Delaware. These include the WMD Response Program, Tactical Medical Operations and UAS Drone Flight Program. He has conducted and supervised complex investigations for both internal and external sources. As a medic team leader for SWAT, he was responsible for significant aspects of mission planning and execution. Adam also has deep roots in the security industry and has been recognized as a subject matter expert on active shooter prevention, countermeasures and UAS flight operations. He does consulting for many private sector corporations and government entities by conducting site assessments, custom workplace violence prevention training and security procedure writing and compliance. Adam provides consulting services for companies looking to integrate UAS flight operations into their security response programs or law enforcement operations. In addition to being an experienced UAS pilot, he is a credentialed instructor with a track record of success. He has served as the Co-Chair of Operations for the State of Delaware UAS Training and Certification Steering Committee providing guidance to Delaware public safety agencies. Adam has been called upon as an expert on UAS operations by local and national media outlets.